11th September 2015, Goodwood: This week at the Goodwood Revival Glenfiddich will launch ‘The Original’ whisky, a unique expression, inspired by our 1963 Glenfiddich Straight Malt. Glenfiddich drams, cocktails and full bottles of The Original will be on sale in the High Street area of the festival in an authentic sixties bar. In 1963, our family began actively marketing our “Straight Malt” to the world, effectively establishing the single malt category as it is known today. A reproduction of the original Glenfiddich Straight Malt, this release is an exclusive addition to the family run distiller’s collection of whiskies. 1963 was the year the whisky world changed forever when Sandy Grant Gordon and Charles Grant Gordon, following in the footsteps of their pioneering forefathers, took the bold decision to launch Glenfiddich “Straight Malt” – the term used to describe single malt – around the globe. Previously, blended whisky dominated the market and single malt was only available to a few in the know. Now, the single malt category as it’s known today was born. Today, Glenfiddich’s Malt Master, Brian Kinsman, has faithfully replicated the historic taste of Glenfiddich Straight Malt. By skilfully nosing and tasting the original 1963 sample and following the original recipe from one of Glenfiddich’s 1960s leather bound ledgers; he has exactly reproduced its celebrated fresh and fruity taste. 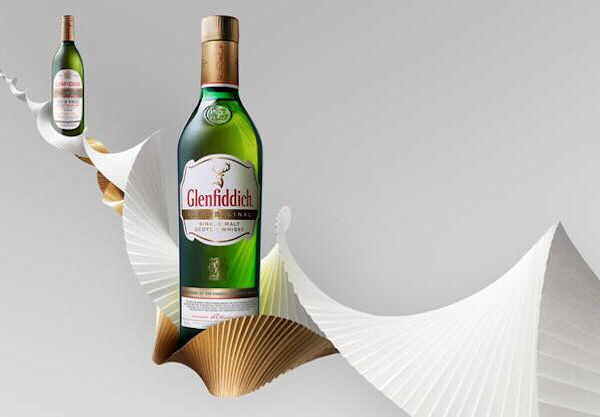 The heritage of Glenfiddich The Original is reflected through the bottle design. Presented in the iconic triangular bottle, it sits in a classic black presentation box embossed with gold. The expression also comes with a booklet that details the whisky’s rich history, making Glenfiddich The Original a unique experience for single malt aficionados. Available from September in luxury whisky retail outlets and premium establishments, Glenfiddich The Original has a recommended retail price of £85.00 for a 70cl bottle which reflects its collectability. Also from September the brand film ‘Case of Dreams’ will be aired in national independent cinemas. This film tells the story of how Sandy Grant Gordon first took the 1963 Glenfiddich Straight Malt to the USA. Nose :A fruity, floral aroma with the hallmark Glenfiddich hint of pear. Subtle oak notes and a youthful biscuity character. Taste : Pleasantly sweet with lively fruit notes and a soft vanilla oakiness. The flavours develop with the addition of a little water and to reveal delicate spices, citrus and fresh baked oatcakes.